Well it’s a three wheeled petrol-driven vehicle which is designed to give people in wheelchairs a level of independence and mobility that they cannot currently get from any other disability scooters or trikes. The Nippi brings fast, fun, long distance, independent road travel within the reach of people with a range of mobility issues. You can commute to work, go shopping, visit friends or enjoy day trips whenever and wherever you want. Watch our Nippi videos to see this ingenious and truly ‘nippy’ vehicle in action. It has been tried and tested by thousands of disabled drivers over almost 30 years and meets all UK traffic regulations for roadworthy vehicles. It is economical to run and maintain, giving you up to 80 miles on a full tank of unleaded petrol. Three different engine sizes are available. Read more on our Nippi specifications page. The Nippi benefits from a welded chassis which forms a safety cage around you. 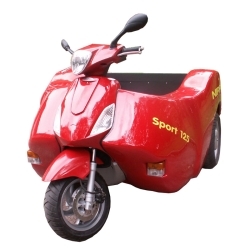 Its three wheels give you great stability and all the wheels have independent suspension to provide great comfort. An all-weather hard top canopy is one of the many options available to Nippi customers. Based on the classic Italian Piaggio scooters, the Nippi has stylish good looks which will attract complements wherever you go. See images of the Nippi in our Nippi gallery. A ramp allows you to drive straight into the Nippi in your wheelchair without needing anyone’s help. Your wheelchair locks securely into place and you close the ramp behind you with a lever – or for an extra charge you can have an electric-powered ramp. Nippi Cars Limited can offer you a range of colour finishes and will also adapt your Nippi and its controls to meet your specific needs. The standard Nippi is operated through hand controls. A motorcycle-type throttle on the Nippi can be adapted to be used by either hand or thumb. Special controls can be provided for customers with mobility issues in their arms and hands. Manual or electric wheelchairs, up to 27 inches wide, fit into a standard Nippi, but this genuinely wheelchair accessible vehicle can be made wider on request. For those who are more able, a motorcycle-type seat can be fitted. There is ONLY one Nippi. Read more about the company behind it on our About Nippi page. If you want your independence and mobility, call now for a demonstration 01283 520620. Or just fill in our online form to Request a Demo and we’ll get back to you.